Service 5/1945 - 7/1971 Retired Lt. Cdr. [Ken Jack: I found Lt.jg (now Lt. Cdr.) Bill Kortge's story during the Cuban Missile Crisis from a CD provided by photomate Richard Crowe, who was at NAS Jacksonville, where the RF-8As returned after their missions and the off-loaded film was processed by the Fleet Air Photo Lab. The CD had a memoir by a photo interpreter, Bill Hocutt PHCS USN (ret. ), serving in the Atlantic Intelligence Center for Commander in Chief Atlantic Fleet, Admiral Robert Dennison. 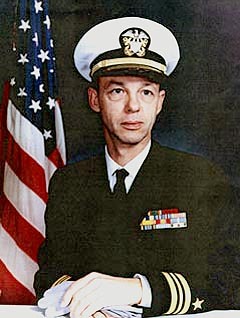 (10/5/13): Dear Sir; my father is LCDR Bernard W. Kortge USN (Ret), whose story you tell with Captain Ecker in an article we found at Commandposts.com [see link on Cuban Missile Crisis page]. My father lives near me, here in Maine, and has been stricken with dementia for the last ten years, and has few memories of the days that you chronicle with Captain Ecker. My father told me this story when I was in high school in the 80s, studying the Cuban Missile Crisis. He was very proud of his service, and especially of his responsibilities in this mission. I am deeply moved to find your retelling of The Story, as so many of the details, and certainly all of the names were very blurred or lost in my second-hand knowledge of it. I feel that you've returned to me a memory of my father that I thought was lost forever. I would like your permission to post this excerpt as a story on my father's page in the Navy Log at the Navy Memorial. At the bottom of this message I will include the excerpt that I am thinking of. This is a link to my father's Navy Log entry. My condolences on Captain Ecker's passing. I'm very grateful that you and he shared your memories and knowledge with us all. Thank you so much for your service, and for your continued involvement with VFP-62, and for considering my request. (3/26/14) In Chapter 11 "Unarmed, Undescorted, and Unafraid" we commented: "